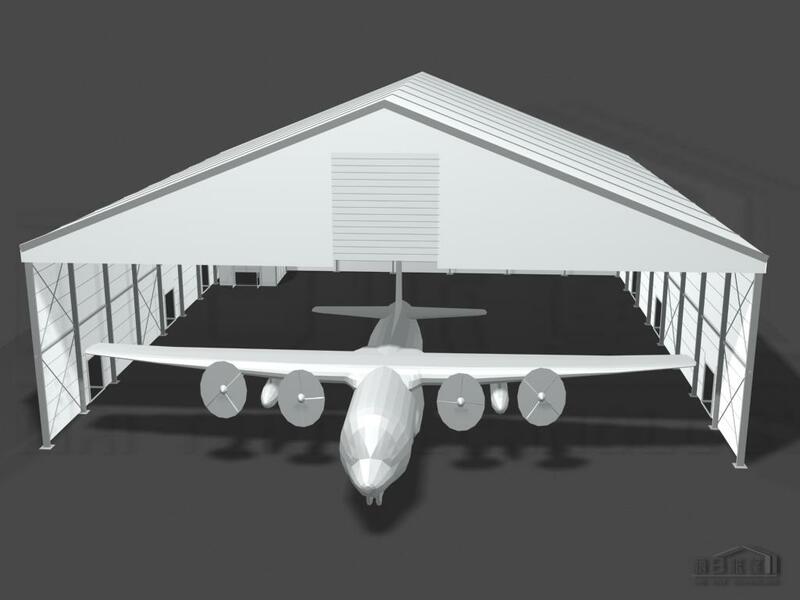 Semi-Permanent and Temporary Structures for Aircraft Facilities. As world-renowned manufacturer of aluminium and steel frame with PVC fabric clear span structures, Liri Structure offers Semi-Permanent and Temporary aluminium structures for airport industry. No matter you need for Hangar, warehouse, logistics or office building in airport, Liri clear span structure will be your best solution. Liri structures are designed for temporary and permanent use both. Expediently, you have no need to be worried about installation site because they are removable as your wish. Advantage for Liri structure is easier to install and disassemble and aluminium frame is light but strong. Most of our products are modular design which means you can extend or shrink them due to your option. As first and largest manufacturer of clear span structure in China. Liri would meet more demand of yours such like installation tools, lighting, air-condition, furniture, and other optional accessories. What we do is to provide superior quality with reasonable prices. Liri Tent technology Co.,Ltd is a leading Chinese company in manufacture, sales and rental of high quality aluminium clear span structure system. Our products have been exported to more than 120 countries in the world. The factory and head office cover 120,000㎡. All of our operations are strictly conducted in accordance with ISO 9001:2008 International Quality Management Systems. As the pioneer in the industry, Liri Technology is the only Chinese tent company gained its own patent designs for over 25 product series. The main frameworks are manufactured by hard pressed extruded aluminium alloy. The roof covers are made of flame-retardant double PVC-coated polyester textile. Our products have a wide range span width from 3m to 80m and multiple designs and shapes, including A shapes, high peak conversions, dome shapes, curved shape, polygon, eyelid hanger, etc. In the past 20 years, Liri always focus on the innovation of high quality clear span structures. Therefore we have a rapid development and won a good reputation in China, as well as around the world. 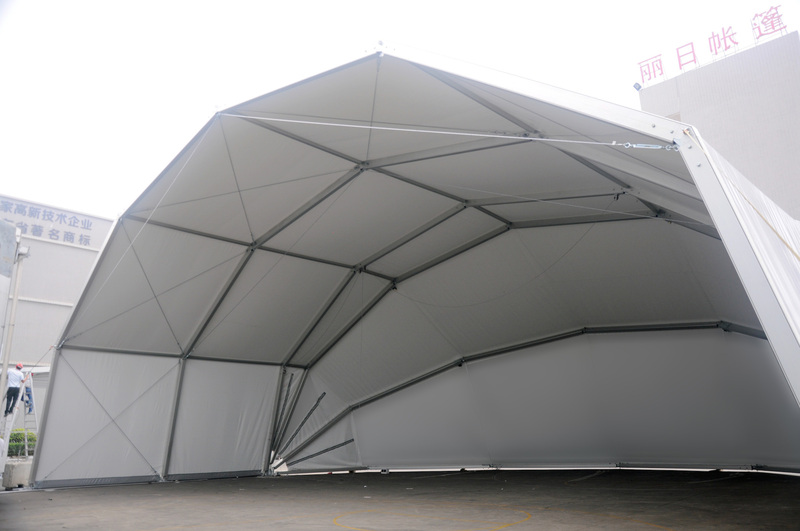 Our hangar tents main frameworks are manufactured with hard pressed extruded anodized aluminium alloy. The covers and sidewalls are made of flame retardant double PVC coated polyester textile strictly based on the European standard DIN 4102B1, M2. 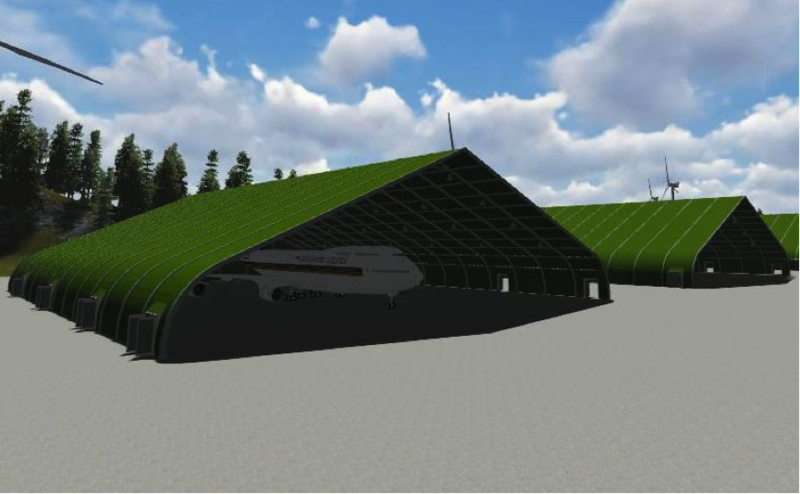 Various dimensions of hangar tents can be manufactured according to different size of aircrafts. The main feature of the frameworks is that it is designed specially based on high degree configuring film insulated PVC textile. 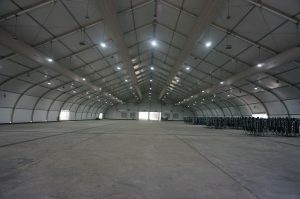 Large span flexible lifting doors and sandwich panel walls form a unique Liri hangar tent. 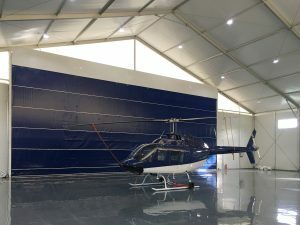 Hangar Tent has multiple kinds of optional accessories to select for different functions, such as film insulated roof cover, insulated sandwich panel walls, large span flexible lifting doors, colorful steel walls, LED lighting, working doors, rolling doors, flooring systems, rain gutter, fire-fighting systems, ventilation systems, and so on. After the new designs of flexible gate and push-pull hangar tent, in 2015 Liri Tent has developed the polygonal eyelid hangar tent. This structure adopts aluminum frame, which is sturdy and durable to resist wind loading 120km/h (0.7kn/m²) and snow loading 25-75 kg/m². Especially we add the driving system to control the movement of the frame unit and the closure and open of the PVC fabric, so that we can achieve the auto operation of the door like the eyelid. 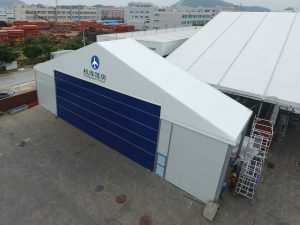 Compared with the permanent hangar structures, eyelid hangar tent is very easy to dismantle and install, and all components can be shipped by plane after dismantle. When parking the plane, the installation can be completed by the crew only. 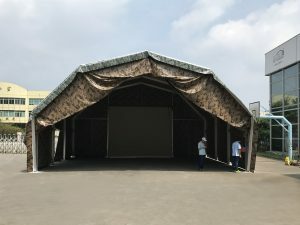 Also due to the good adaptability to different terrain, the hangar tent can be set up on both concrete ground and grass land, even for temporary grounds, which reduce the difficulty of construction on site and shorten the installation time. This hangar tent is very suitable to use as temporary or permanent garage for air forces and the civil aviation aircraft. 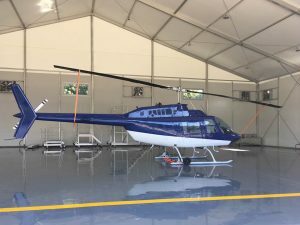 The size of eyelid hangar tent is not fixed, so we can customize the tent size by dimensions of airplanes and demands of buyers and choose different accessories for various applications. 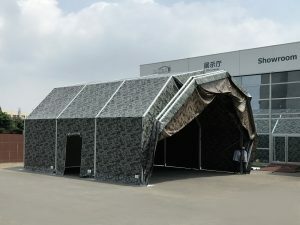 This innovative outdoor hangar tent is flexible, movable, convenient, and cost-effective. 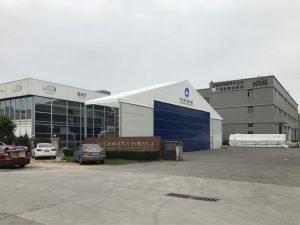 Whether you need a permanent industrial applications building or temporary warehousing structure in airport, Liri Technology can provide you ideal solutions. Warehouse Tent construction does not require a permanent foundation which can be built in almost any ground-asphalt, concrete or grass, and so on. Advantage of flexibility and economy is far superior to conventional steel structures. Because of requirement for construction is not high and the cost is low, so maintenance is simple and inexpensive. Curve Tent series was developed to become quite popular and got high praise from all over the world with its high quality and elegant exterior since it’s available. It is modular structure from 12m – 40m, and can be increased or decreased in 5m bay. 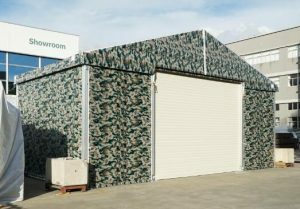 The roof cover and sidewalls are made of flame-retardant double PVC-coated polyester textile. Curve Tent can be flexibly removed and expanded with its modular structure. 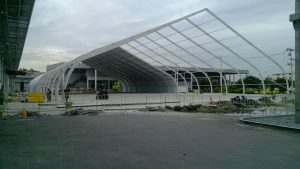 It can be applied in many temporary events as well as the Big Tent series, also it’s a good choice as permanent building. 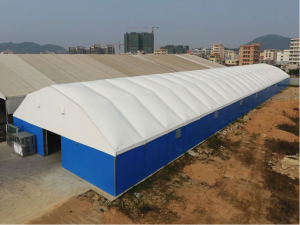 A variety of optional accessories expand the function and usage of curve tent, such as ground anchors, ABS solid walls, steel sandwich walls, corrugated steel sheet walling, sliding doors, roller shutters, sidewalls, flooring system, hard PVC rain gutters and so on. 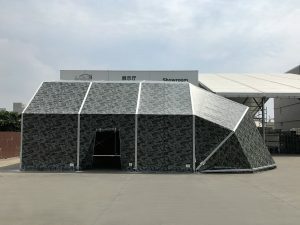 The roof beams of the polygon top Tent are combined by several split aluminum alloy beams and in polygon shape with width of 10m up to 70m. It can also be customized for clients’ special requirements. 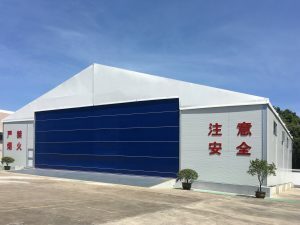 The main applications of polygon huge hall are terminals, parking lot, airtight storage for maintenance hangars, aircraft hangars personnel and workshop facilities, vehicles and equipment. All tents can be equipped with lighting, air conditioning and heating, electrical opening system, with climate control and dehumidification, sunscreens etc.